The Seven Penitential Psalms form an essential section of the prayers of the divine office. These seven psalms, beginning with Psalm 6 ('O Lord, rebuke me not in thine anger'), express remorse for sin and hope for forgiveness. 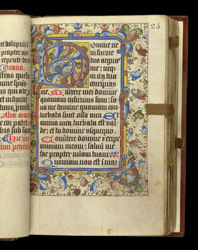 This page has Psalm 6, the beginning of the Penitential Psalms. Prayerbooks were usually decorated in some way. This breviary has rather rich decoration in comparison with some of the other manuscripts from Syon but modest next to many contemporary examples.